Create this Rub ‘n Buff® Snowflake Ornament using Delight™ air dry modeling compound. 1. Cut a section from foam sheet slightly larger than stamp. Heat both sides of foam till soft and glossy. 2. Immediately press stamp onto hot foam. Press firmly and hold for a few seconds. Lift off stamp. You now have a reverse image of your stamp. 3. Open a pack of Delight™ Air Dry Modeling Compound and remove a generous wad. Seal the remainder in an air tight bag. Roll wad of Delight onto wax paper approximately the size of foam piece and approximately 1/8 inch thick. 4. Now place Delight piece on foam image and roll over once in all four directions to even clay and to impress the image. Do not over roll or clay may slip off and you will smear image. Lift off foam piece gently. 5. Trace around raised stamped image with a clay tool or tooth pick. Smooth edges with your finger and re shape any points if necessary. Lay flat to dry. 6. 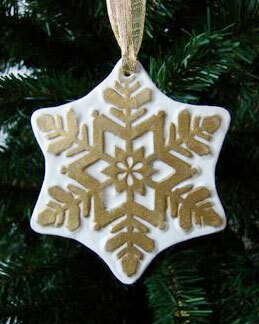 After snowflake ornament has dried take selected color of Rub ’n Buff and squeeze a small amount onto a scrap piece of paper. 7. With a Kleenex or your finger take a very small amount of Rub ‘n Buff and rub lightly over raised areas. Start with very little as it is easier to put on more than to take off. 8. Spray with Workable Fixatif. 9. Make a hole in one of the snowflake points with an awl or clay tool. 10. Feed ribbon through the hole, knot and make a bow. Tip: Do not bake Delight™ air dry modeling compound in the oven.